Open access Prehistoric migrations through the Mediterranean basin shaped Corsican Y-chromosome diversity, by Di Cristofaro et al. PLOS One (2018). 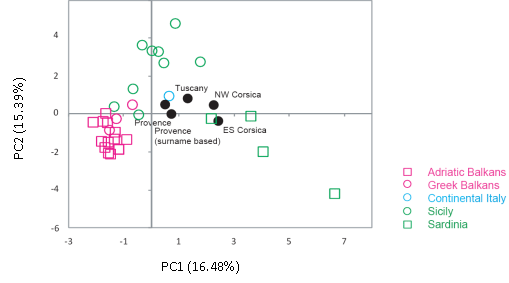 This study included 321 samples from men throughout Corsica; samples from Provence and Tuscany were added to the cohort. All samples were typed for 92 Y-SNPs, and Y-STRs were also analyzed. Spatial frequency maps for haplogroups with frequencies above 3%, their Y-STR based phylogenetic networks in Corsican populations (Blue: North, Green: West, Orange: South, Black: Center and Purple: East) and their TMRCA (in years, +/- SE). Haplogroup G reached 21.7% in Corsica and 13.3% in Tuscany. Sub-clade G2a2a1a2-L91 accounted for 11.3% of all haplogroups in Corsica yet was not present in Provence or in Tuscany. Thirty-four out of the 37 G2a2a1a2-L91 displayed a unique Y-STR profile, illustrated by the star-like profile of STR networks (Fig 1). G2a2a1a2-L91 and G2a2a-PF3147(xL91xM286) show their highest frequency in present day Sardinia and southern Corsica compared to low levels from Caucasus to Southern Europe, encompassing the Near and Middle East [21,47–50]. 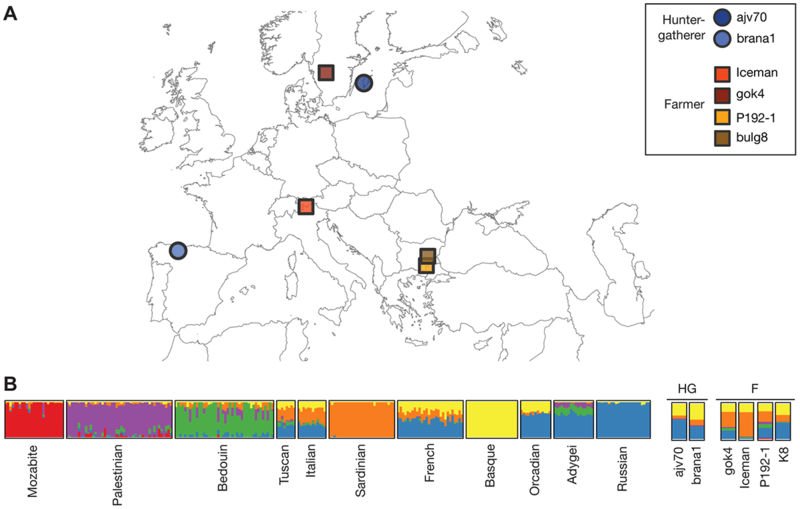 Ancient DNA results from Early and Middle Neolithic samples reported the presence of haplogroup G2a-P15 [51–53], consistent with gene flow from the Mediterranean region during the Neolithic transition. Td expansion time estimated by STR for P15-affiliated chromosomes was estimated to be 15,082+/-2217 years ago . Ötzi, the 5,300-year-old Alpine mummy, was derived for the L91 SNP . 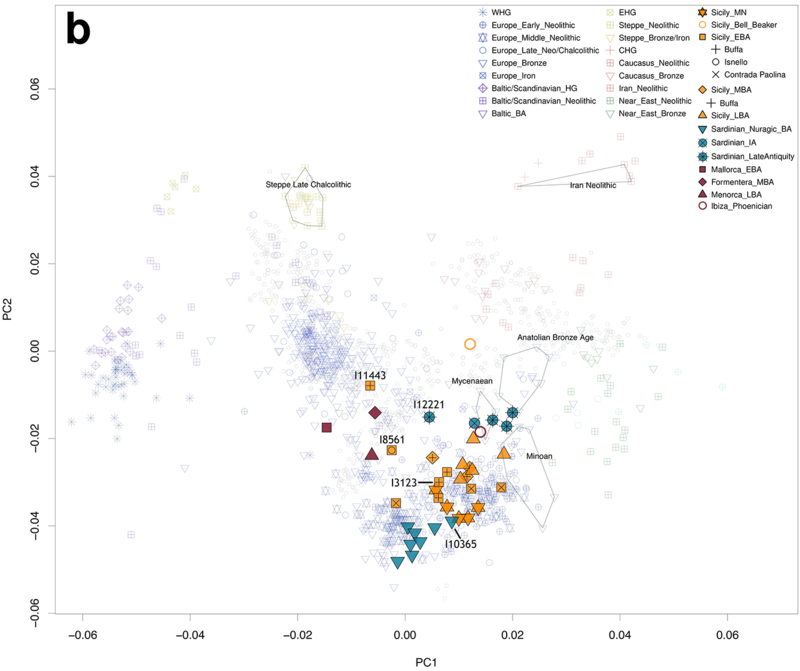 A genetic relationship between G haplogroups from Corsica and Sardinia is further supported by DYS19 duplication, reported in North Sardinia , and observed in the southern part of the Corsica in 9 out of 37 G2a2a1a2-L91 chromosomes and in 4 out of 5 G2a2a-PF3147(xL91xM286) chromosomes, 3 of which displayed an identical STR profile (S4 Table). This lineage has a reported coalescent age estimated by whole sequencing in Sardinian samples of about 9,000 years ago. 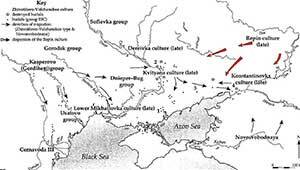 This could reflect common ancestors coming from the Caucasus and moving westward during the Neolithic period , whereas their continental counterparts would have been replaced by rapidly expanding populations associated with the Bronze Age [46,54,55]. Estimated TMRCA for L91 lineage in Corsica is 4529 +/- 853 years. G-L497 showed high frequencies in Corsica compared to Provence and Tuscany, and this haplogroup was common in Europe, but rare in Greece, Anatolia and the Middle East. Fifteen out of the 17 Corsican G2a2b2a1a1b-L497 displayed a unique Y-STR profile (S4 Table) with an estimated TMRCA of 6867 +/- 1294 years. Haplogroup G2a2b1-M406, associated with Impressed Ware Neolithic markers, along with J2a1-DYS445 = 6 and J2a1b1-M92 [22,49], had very low levels in Corsica. Conversely, G2a2b2a-P303was highly represented and seemed to be independent of the G2a2b1-M406 marker. The 7 G2a2b2a-P303(xL497xM527) Corsican chromosomes displayed a unique Y-STR profile (S4 Table). 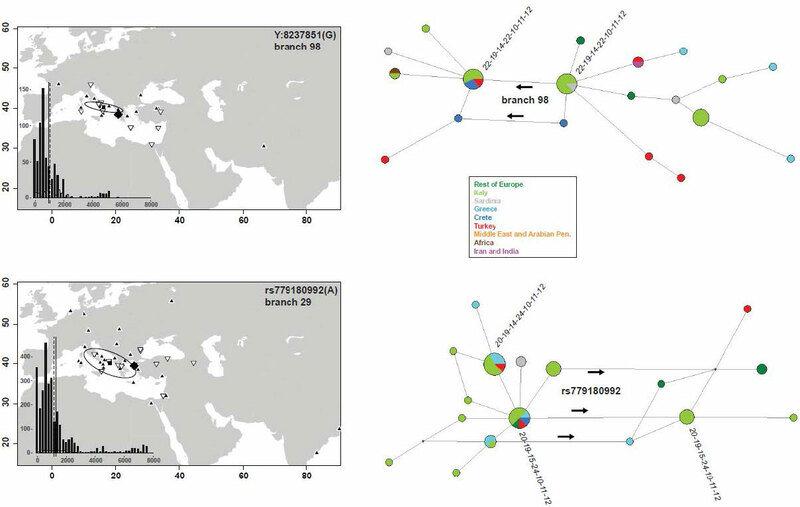 First and second axes of the PCA based on 12 Y-chromosome haplogroup frequencies in 83 west Mediterranean populations. Open access A finely resolved phylogeny of Y chromosome Hg J illuminates the processes of Phoenician and Greek colonizations in the Mediterranean, by Finocchio et al. Scientific Reports (2018) Nº 7465. In order to improve the phylogeography of the male-specific genetic traces of Greek and Phoenician colonizations on the Northern coasts of the Mediterranean, we performed a geographically structured sampling of seven subclades of haplogroup J in Turkey, Greece and Italy. We resequenced 4.4 Mb of Y-chromosome in 58 subjects, obtaining 1079 high quality variants. 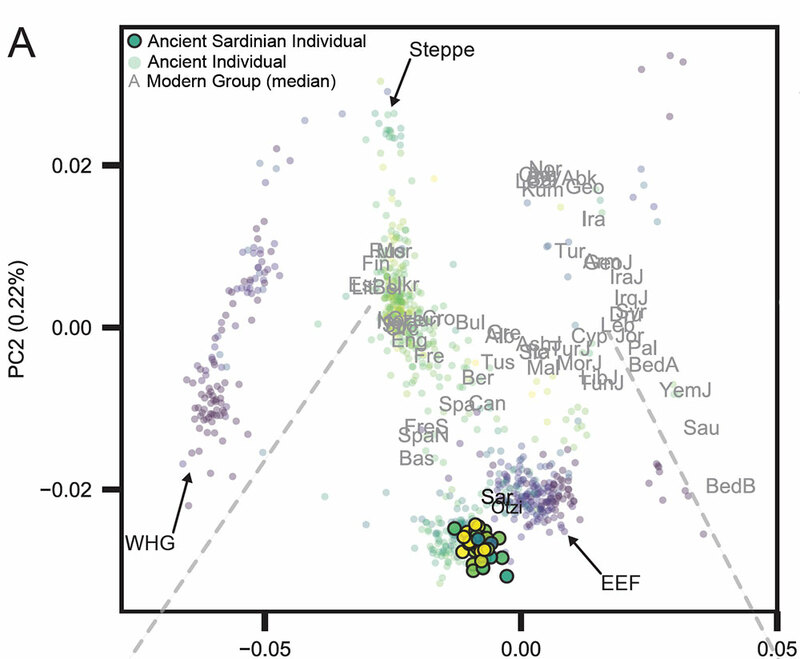 We did not find a preferential coalescence of Turkish samples to ancestral nodes, contradicting the simplistic idea of a dispersal and radiation of Hg J as a whole from the Middle East. Upon calibration with an ancient Hg J chromosome, we confirmed that signs of Holocenic Hg J radiations are subtle and date mainly to the Bronze Age. We pinpointed seven variants which could potentially unveil star clusters of sequences, indicative of local expansions. 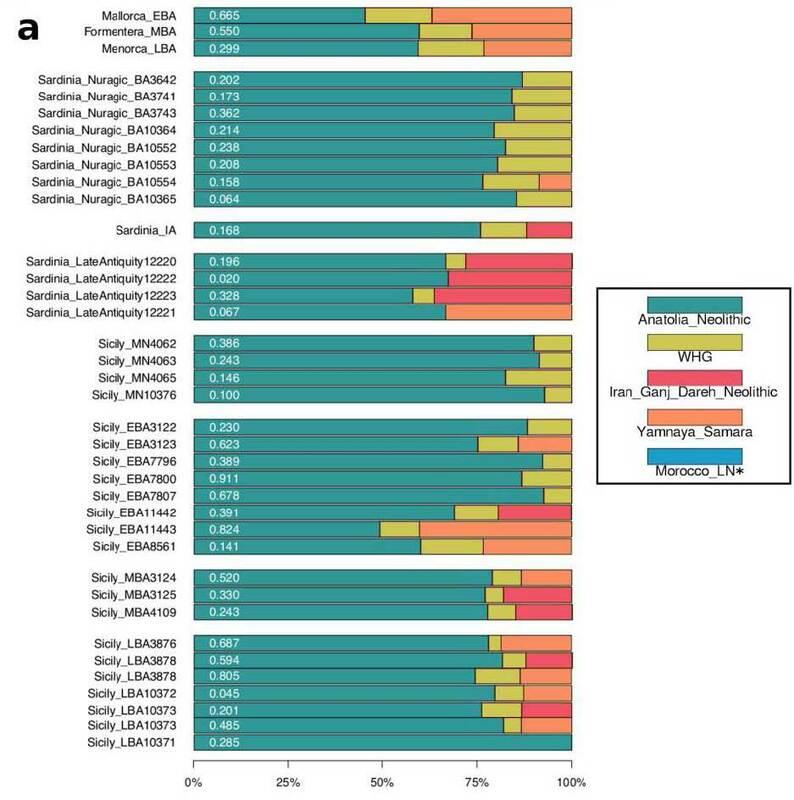 By directly genotyping these variants in Hg J carriers and complementing with published resequenced chromosomes (893 subjects), we provide strong temporal and distributional evidence for markers of the Greek settlement of Magna Graecia (J2a-L397) and Phoenician migrations (rs760148062). Our work generated a minimal but robust list of evolutionarily stable markers to elucidate the demographic dynamics and spatial domains of male-mediated movements across and around the Mediterranean, in the last 6,000 years. J2-L397. The star indicates the centroid of derived alleles. The solid square indicates the centroid of ancestral alleles, with its 95% C.I. (ellipse). In the insets: distributions of the pairwise sampling distances (in Km) for the carriers of the ancestral (black) and derived (white) allele, with solid and dashed lines indicating the respective averages. At right: median joining network of 7-STR haplotypes and SNPs in the same groups, with sectors coloured according to sampling location. Haplotype structure is detailed for some nodes, in the order YCA2a-YCA2b-DYS19-DYS390-DYS391-DYS392-DYS393 (in italics). Two features of our tree are at odds with the simplistic idea of a dispersal of Hg J as a whole from the Middle East towards Greece and Italy and an accompanying radiation26. First, there is little evidence of sudden diversification between 15 and 5 kya, a period of likely population increase and pressure for range expansion, due to the Agricultural revolution in the Fertile Crescent. Second, within each subclade, lineages currently sampled in Turkey do not show up as preferentially ancestral. 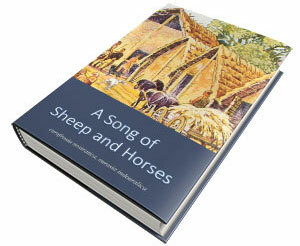 Both findings are replicated and reinforced by examining the previous landmark studies. 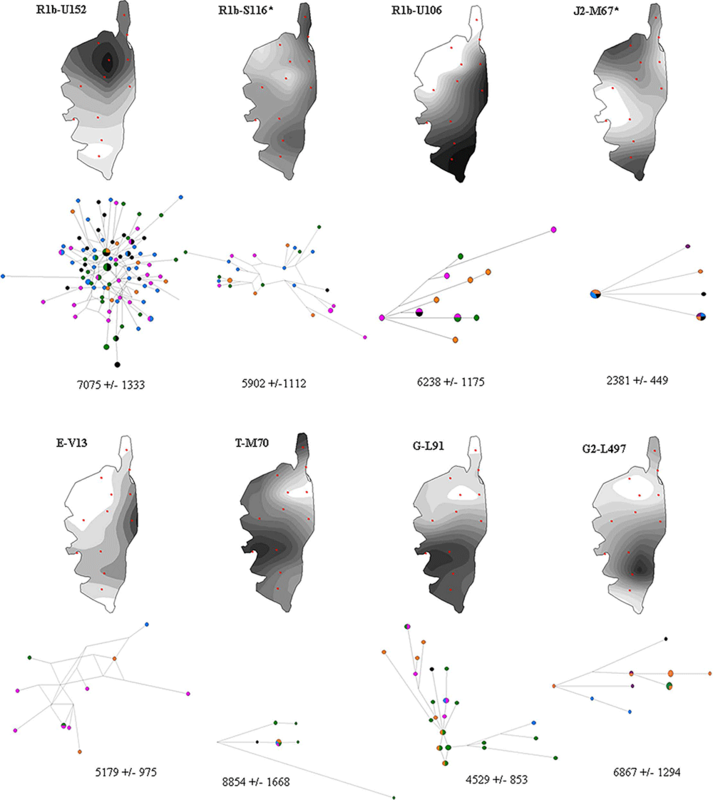 Our Turkish samples do not coalesce preferentially to ancestral nodes when mapped onto these studies’ trees. Additional relevant information on the entire Hg J comes from the discontinuous distribution of J2b-M12. The northern fringe of our sample is enriched in the J2b-M241 subclade, which reappears in the gulf of Bengal38,45, with low frequencies in the intervening Iraq46 and Iran47. No J2b-M12 carriers were found among 35 modern Lebanese, as contrasted to one of two ancient specimens from the same region35. In summary, a first conclusion of our sequencing effort and merge with available data is that the phylogeography of Hg J is complex and hardly explained by the presence of a single population harbouring the major lineages at the onset of agriculture and spreading westward. A unifying explanation for all the above inconsistencies could be a centre of initial radiation outside the area here sampled more densely, i.e. the Caucasus and regions North of it, from which different Hg J subclades may have later reached mainland Italy, Greece and Turkey, possibly following different routes and times. Evidence in this direction comes from the distribution of J2a-M41045,48 and the early-49 or mid-Holocene50 southward spread of J1. Supplemental Figure 7. Maps of sampling locations for the carriers of the derived allele (white triangle point down) at the indicated SNP vs carriers of the ancestral allele (black triangle point-up), conditioned on identical genotype at the same most terminal marker. 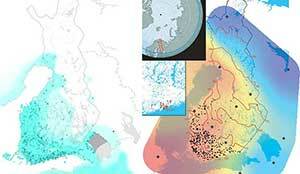 Coastlines were drawn with the R packages18 “map” and “mapproj” v. 3.1.3 (https://cran.r-project.org/web/packages/mapproj/index.html), and additional features added with default functions. The star triangle indicates the centroid of derived alleles. The solid square indicates the centroid of ancestral alleles, with its 95% C.I. (ellipse). In the insets: distributions of the pairwise sampling distances (in Km) for the carriers of the ancestral (black) and derived (white) allele, with solid and dashed lines indicating the respective averages. At right: median joining network of 7-STR haplotypes and SNPs in the same groups, with sectors coloured according to sampling location. Haplotype structure is detailed for some nodes, in the order YCA2a-YCA2b-DYS19-DYS390-DYS391-DYS392-DYS393 (in italics). The lineage defined by rs779180992, belonging to J2b-M205, and dated at 4–4.5 kya, has a radically different distribution, with derived alleles in Continental Italy, Greece and Northern Turkey, and two instances in a Palestinian and a Jew. The interpretation of the spread of this lineage is not straightforward. 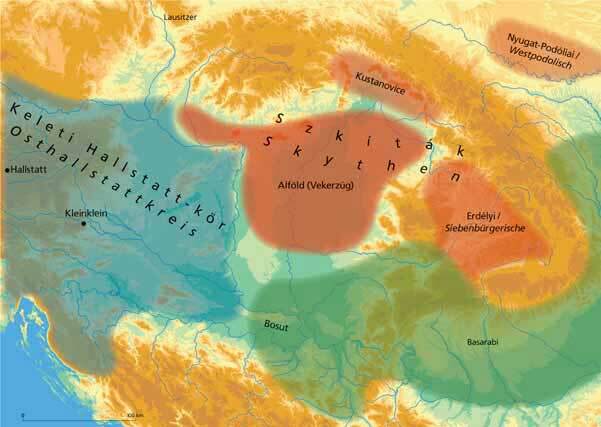 Tentative hypotheses are linked to Southward movements that occurred in the Balkan Peninsula from the Bronze Age29,53, through the Roman occupation and later54. 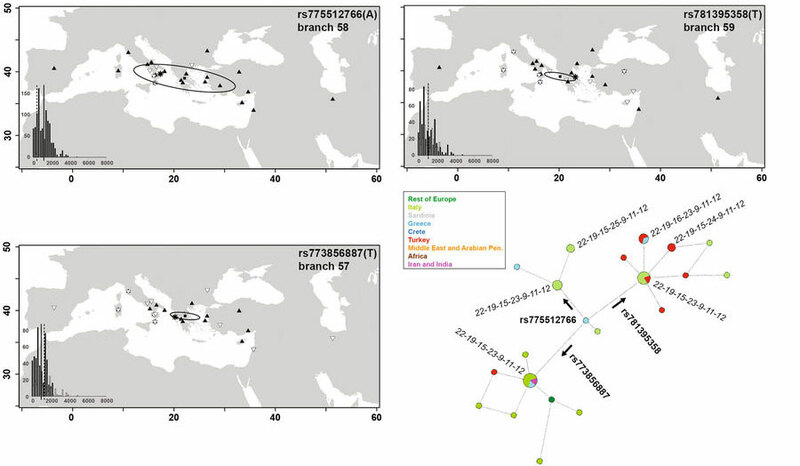 The slightly older (5.6–6.3 kya) branch 98 lineage displays a similar trend of a Eastward positioning of derived alleles, with the notable difference of being present in Sardinia, Crete, Cyprus and Northern Egypt. This feature and the low frequency of the parental J2a-M92 lineage in the Balkans27 calls for an explanation different from the above. Finally, we explored the distribution of J2a-L397 and three derived lineages within it. J2a-L397 is tightly associated with a typical DYS445 6-repeat allele. 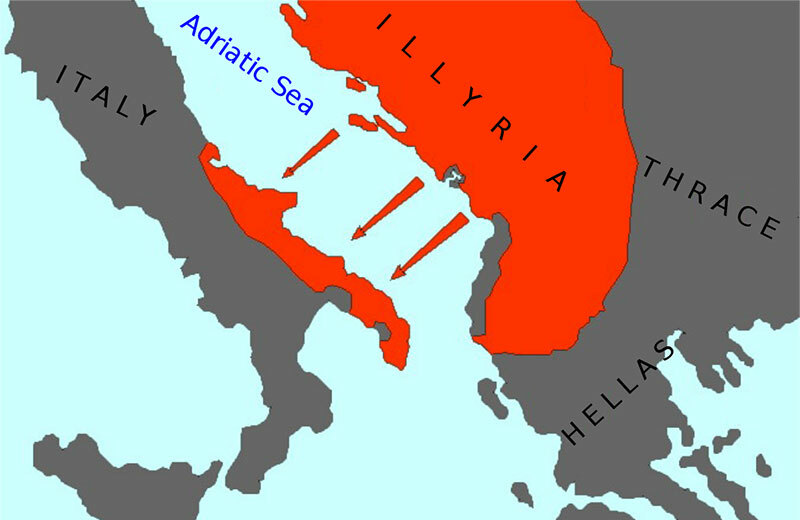 This has been hypothesized as a marker of the Greek colonizations in the Mediterranean55, based on its presence in Greek Anatolia and Provence (France), a region with attested Iron Age Greek contribution. 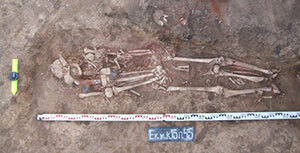 All of our chromosomes in this clade were characterized also by DYS391(9), confirming their Anatolian Greek signature. We resolved the J2a-L397 clade to an unprecedented precision, with three internal markers which allow a finer discrimination than STRs. The ages of the three lineages (2.0–3.0 kya) are compatible with the beginning of the Greek colonial period, in the 8th century BCE. The three subclades have different distributions (Fig. 2B), with two (branches 57, 59) found both East and West to Greece, and one only in Italy (branch 58). As to Mediterranean Islands, J2a-L397 was found in Cyprus56 and Crete43. 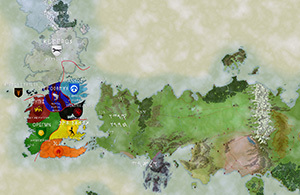 Its presence as one of the three branches 57–59 will represent an important test. In Italy all three variants were found mainly along the Western coast (18/25), which hosted the preferred Greek trade cities. The finding of all three differentiated lineages in Locri excludes a local founder effect of a single genealogy. Interestingly, an important Greek colony was established in this location, with continuity of human settlement until modern times. 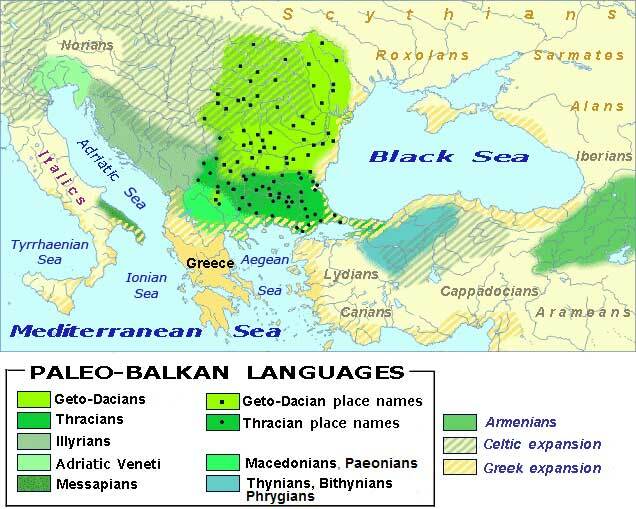 The sample composed of the same subjects displayed genetic affinities with Eastern Greece and the Aegean also at autosomal markers57. In summary, the distributions of branches 57–59 mirror the variety of the cities of origin and geographic ranges during the phases of the colonization process58. So, there you have it, another proof that haplogroup J and CHG-related ancestry in the Mediterranean was mainly driven by different (and late) expansions of historic peoples. Ph.D. thesis Assessing Migration and Demographic Change in pre-Roman and Roman Period Southern Italy Using Whole-Mitochondrial DNA and Stable Isotope Analysis, or The Biogeographic Origins of Iron Age Peucetians and Working-Class Romans From Southern Italy, by Matthew Emery, McMaster University (2018). Assessing population diversity in southern Italy has traditionally relied on archaeological and historic evidence. Although informative, these lines of evidence do not establish specific instances of within lifetime mobility, nor track population diversity over time. In order to investigate the population structure of ancient South Italy I sequenced the mitochondrial DNA (mtDNA) from 15 Iron Age (7th – 4th c. BCE) and 30 Roman period (1st – 4th c. BCE) individuals buried at Iron Age Botromagno and Roman period Vagnari, in southern Italy, and analyzed δ18O and 87Sr/86Sr values from a subset of the Vagnari skeletal assemblage. 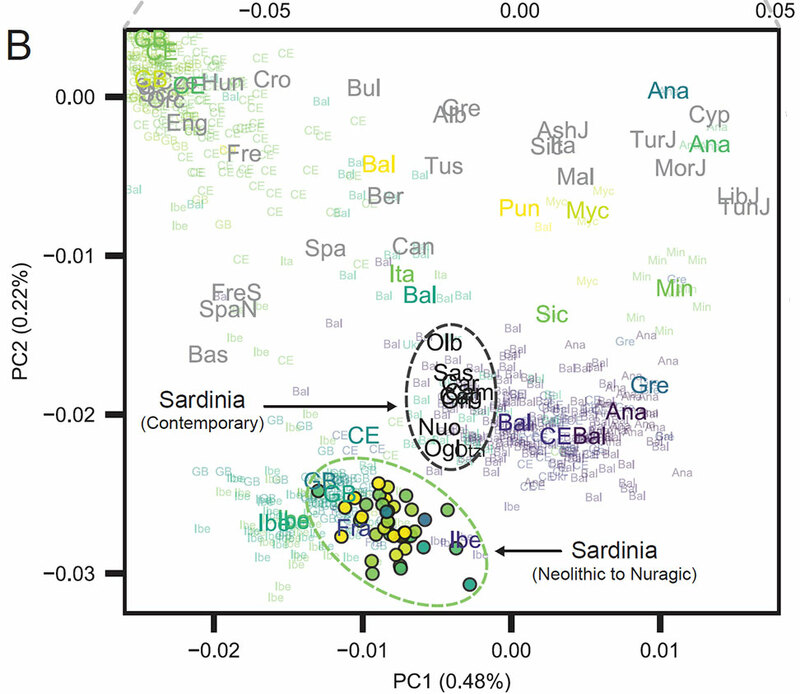 Phylogenetic analysis of 15 Iron Age mtDNAs together with 231 mtDNAs spanning European prehistory suggest that southern Italian Iapygians share close genetic affinities to Neolithic populations from eastern Europe and the Near East. 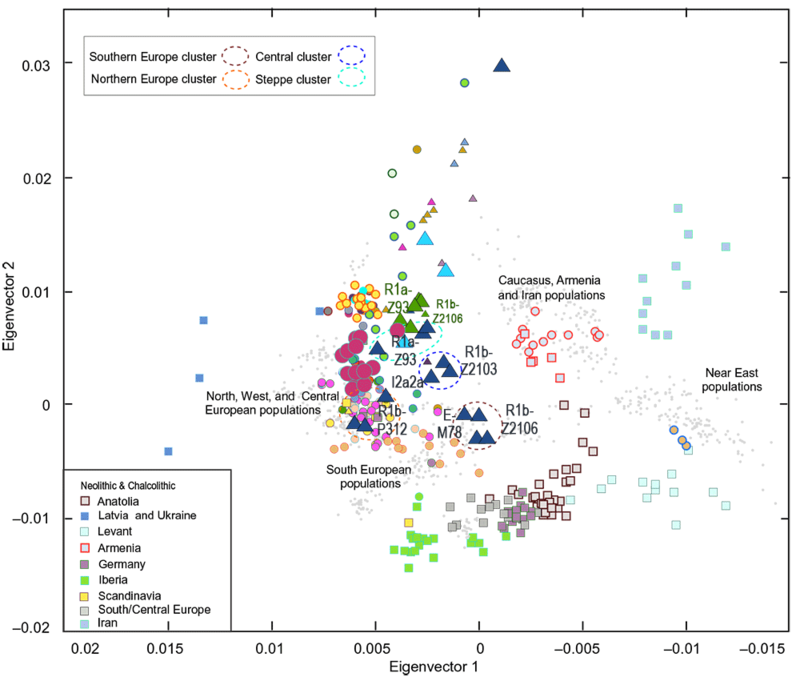 Population pairwise analysis of Iron Age, Roman, and mtDNA datasets spanning the pan-Mediterranean region (n=357), indicate that Roman maternal genetic diversity is more similar to Neolithic and Bronze Age populations from central Europe and the eastern Mediterranean, respectively, than to Iron Age Italians. Genetic distance between population age categories imply moderate mtDNA turnover and constant population size during the Roman conquest of South Italy in the 3rd century BCE. In order to determine the local versus non-local demographic at Vagnari, I measured the 87Sr/86Sr and 18O/16O of composition of 43 molars, and the 87Sr/86Sr composition of an additional 13 molars, and constructed a preliminary 87Sr/86Sr variation map of the Italian peninsula using disparate 87Sr/86Sr datasets. The relationship between 87Sr/86Sr and previously published δ18O data suggest a relatively low proportion of migrants lived at Vagnari (7%). This research is the first to generate whole-mitochondrial DNA sequences from Iron Age and Roman period necropoleis, and demonstrates the ability to gain valuable information from the integration of aDNA, stable isotope, archaeological and historic evidence. mtDNA haplogroup composition between Botromagno (7th – 4th century BCE; n=15) and Vagnari (1st – 4th century CE; n=30) skeletal assemblages. 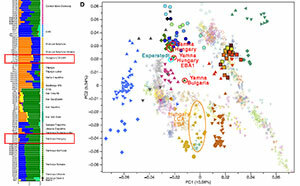 Taken together, population pairwise ΦST, and the distribution of mtDNA haplotypes in relation to the comparative mtDNA data set show that the Iron Age southern Italians likely descended from early to late Neolithic farmers from Anatolia and possibly as far East as the Caucasus, and from migrants arriving from eastern Europe around the late Neolithic/early Bronze Age. 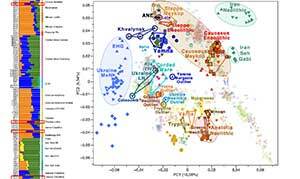 These findings support previous hypotheses that the ancestors of the Iapygians may have originated in the eastern Balkan region, or derive shared ancestry with a common source population from eastern Europe. 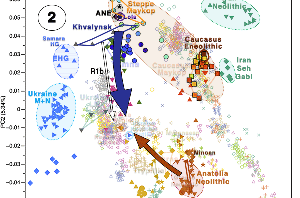 Alternatively, southern Italian Iron Age mtDNA variation might also reflect LGM gene flow between southwestern European, Mediterranean, and Carpathian basin refugia, which was suggested for haplogroup subclusters of U5 and J (Malyarchuk et al., 2010; Pala et al., 2012). Future mtDNA (and nuclear DNA) analysis comprised of a larger Iron Age data set from southern Italy is necessary to answer Theodor Mommsen’s initial hypothesis that the Iapygians were the oldest immigrants to the southern Italian region. 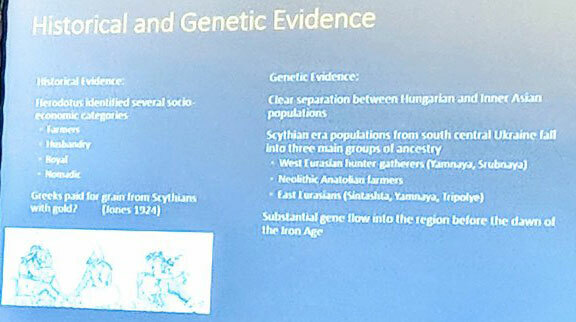 Our investigation provides the first mtDNA evidence for the maternal ancestral affiliations of a subset of the Iapygian individuals recovered from southern Italy, and suggests a closer genetic link to European Neolithic and Iron Age Armenians, than to Bronze Age Aegeans. 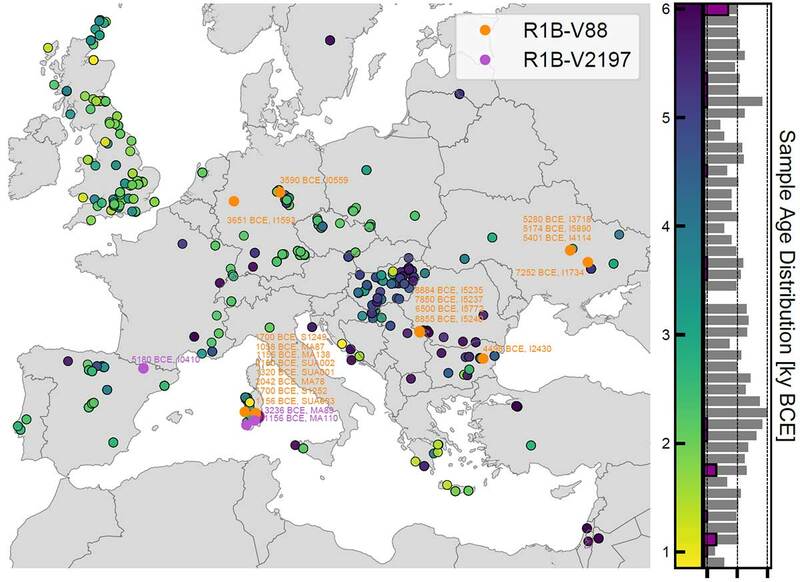 Future comparative ancient DNA data using whole-genome SNP, mtDNA, and NRY-chromosome analysis of pre-Roman populations will provide complementary evidence for the ancestral roots of understudied Iron Age individuals from Italy. Archaeological evidence indicates that the Iapygians traded and incorporated Hellenistic elements into their material and cultural traditions (Small, 1992; Peruzzi, 2016). These changes are most apparent in burial custom and ceramic production, and become increasingly prominent by 2400 BP (Peruzzi, 2016). 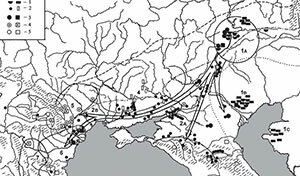 Further evidence shows that Iron Age communities across South Italy retracted in size amidst ongoing conflict between colonies in Magna Graecia, and Rome and Carthage (Small, 1992). This apparent change was interpreted as a decline in local populations throughout the region. However, Bayesian Skygrid analysis using the mtDNA profiles of 15 Iapygians and 30 Roman period individuals suggest that female effective population size was comparable between the two populations. 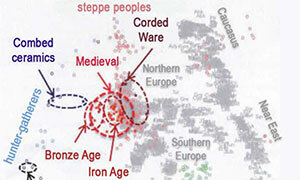 In Chapter 4, population distance (measured as population pairwise ΦST values) across a range of mtDNAs obtained from the pan-Mediterranean, European, and western Asian regions suggest closer maternal affinities to Neolithic and Bronze Age populations from the eastern Mediterranean as a cohort, than with Iron Age Italians. 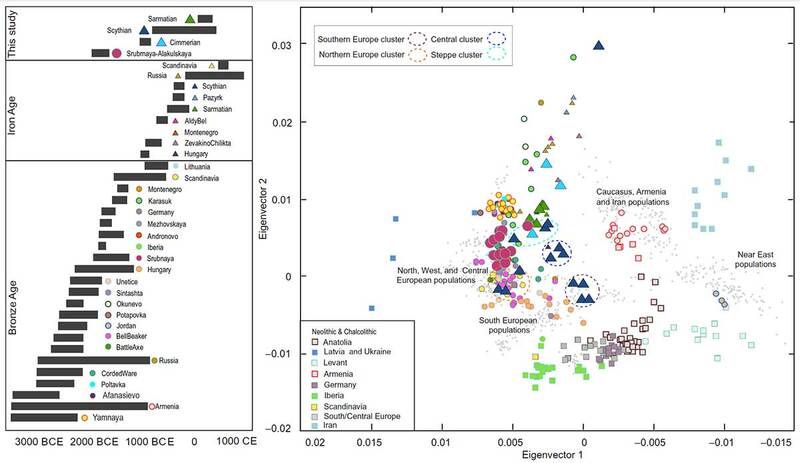 This finding points to moderate mtDNA turnover, and is likely the consequence of Roman gene flow stemming from central and northern Italy via the migration and subsequent occupation by Roman colonies after 2250 BP. Roman Imperial pursuits peaked by ~2050 BP. This extension of power, coupled with an increase in food and materials procurement, was driven by a substantial labour force comprised of both low status Romans and slaves (Harris, 1980; Bradley, 1987, 1994, 2000). Although several attempts have been made to quantify the number of slaves required to maintain the Roman economy, it is unknown what fraction of the Roman population was slave-owned (~approximately 1 to 3 million by 2050 BP) (Scheidel, 2005). Rome’s slave acquisition during the early centuries of the Republic was likely maintained through military campaigns and conquest, a trend that is well documented in Italy (Scheidel, 1997, 1999, 2005; Harris, 1999; Small, 2002). However, once territory was secured, local slave populations were likely maintained through one or a combination of the following: i) the importation of slaves from non-local regions, ii) were born to slave-owned parents, or iii) were voluntarily self-enslaved to acquire subsistence (Harris, 1999). The importation of foreign slaves was likely more costly than maintaining a self-reproducing slave population, especially in rural areas. As such, rural Roman necropoleis, such Vagnari, provide an opportune case to determine the local versus non-local demographic. Archaeological evidence suggests that Vagnari was involved in agriculture and industrial procurement, and was likely staffed by low-class individuals possibly including slaves (Small et al., 2000). However, without direct archaeological or epigraphic evidence, it is impossible to identify the proportion of slaves at rural sites. Multi-dimensional scaling plots showing pairwise ΦST values by a) age and b) country. We removed age and geographic categories with less than 5 mtDNA sequence representation to reduce scaling stress, which decreased the sample size from 402 mtDNAs to n = 378 by age, and n= 382 by country. a) MDS plot of the mtDNA categorized by country of origin; b) MDS of mtDNA dataset by age spanning the Upper Paleolithic (pre-LGM) to the Roman period. IronAge 1 = Italian Iron Age samples; IronAge 2 = Armenian Iron Age samples; Roman 1 = Italian Roman samples; Roman 2 = Egyptian Roman samples; TIP = Third Intermediary Period (Egypt); LP = Late Period (Egypt); PP = Ptolemaic Period (Egypt). 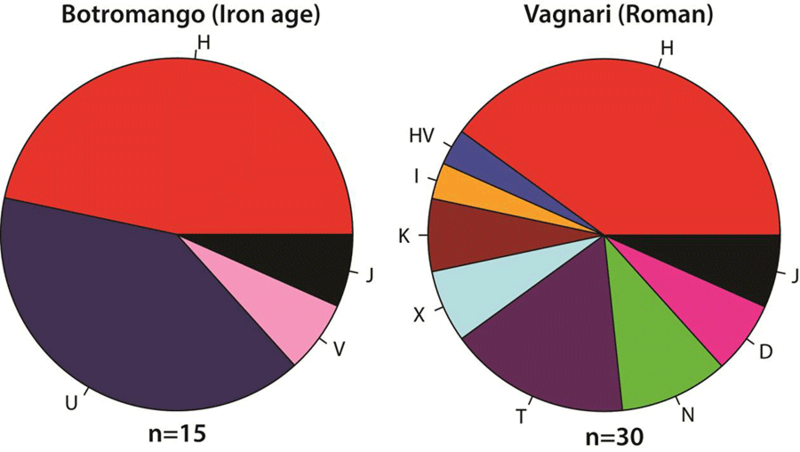 (…) The isotope values presented in Chapter 3 obtained from 56 Roman individuals buried at Vagnari suggest that over half (58%) were born directly at Vagnari, with a further 34% originating from South Italy. Only 7% (3/43 with both δ18O and 87Sr/86Sr values) of the individuals sampled resulted in isotope values non-local to the southern peninsula. Two of these individuals originated from either northern Italy or, more broadly, from central Europe, while one individual likely originated from North Africa. 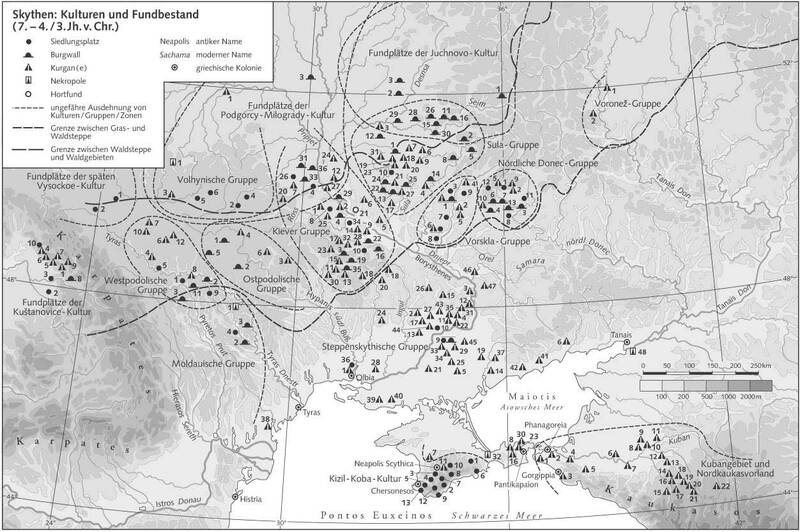 Overall, the isotope data suggest a low number of immigrants at Vagnari, which conforms with the population pairwise (ΦST) data for the Iron Age and Roman mtDNAs, and suggests that as the Romans occupied the region, they populated their Imperial properties with people from central Italy (possible the region of Latium, and the surrounding environs of Rome). These results also integrate with the historical evidence concerning the Roman slave economy during the Imperial period. Future research using a larger comparative dataset comprised of pre-Roman and Roman period mtDNAs, δ18O and, 87Sr/86Sr results will refine the interpretations outlined here. A paper from this thesis is already published in a peer-review journal, Mapping the origins of Imperial Roman workers (1st–4th century CE) at Vagnari, Southern Italy, using 87Sr/86Sr and δ18O variability, Am J Phys Anthropol (2018). Interesting article, Spatio-temporal deixis and cognitive models in early Indo-European, by Annamaria Bartolotta, Cognitive Linguistics (2018); 29(1):1-44. This paper is a comparative study based on the linguistic evidence in Vedic Sanskrit and Homeric Greek, aimed at reconstructing the space-time cognitive models used in the Proto-Indo-European language in a diachronic perspective. 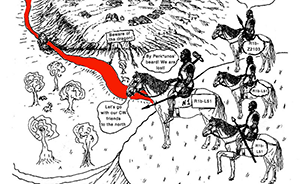 While it has been widely recognized that ancient Indo-European languages construed earlier (and past) events as in front of later ones, as predicted in the Time-Reference-Point mapping, it is less clear how in the same languages the passage took place from this ‘archaic’ Time-RP model or non-deictic sequence, in which future events are behind or follow the past ones in a temporal sequence, to the more recent ‘post-archaic’ Ego-RP model that is found only from the classical period onwards, in which the future is located in front and the past in back of a deictic observer. Data from the Rigveda and the Homeric poems show that an Ego-RP mapping with an ego-perspective frame of reference (FoR) could not have existed yet at an early Indo-European stage. In particular, spatial terms of front and behind turn out to be used with reference not only to temporal events, but also to east and west respectively, thus presupposing the existence of an absolute field-based FoR which the temporal sequence is metaphorically related to. Specifically, sequence is relative position on a path appears to be motivated by what has been called day orientation frame, in which the different positions of the sun during the day motivate the mapping of front onto ‘earlier’ and behind onto ‘later’, without involving ego’s ‘now’. These findings suggest that early Indo-European still had not made use of spatio-temporal deixis based on the tense-related ego-perspective FoR found in modern languages.